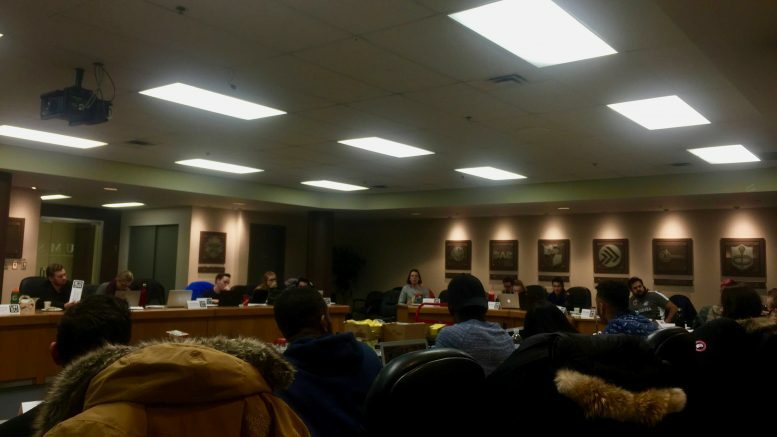 The University of Manitoba Students’ Union (UMSU) council passed an emergency motion Thursday demanding an apology from the national executive of the Canadian Federation of Students (CFS) for its treatment of UMSU executives at the CFS national general meeting in November. The motion also recommends UMSU’s ongoing efforts to reconcile with CFS following a three year dispute be halted until a formal apology is issued. The emergency motion was introduced to council following a presentation from UMSU vice-president external Wilfred Sam-King, vice-president internal Adam Pawlak, and the union’s governance assistance Mark Stewart, detailing UMSU’s contentious history with CFS and the events that took place at the general meeting last month in Ottawa. UMSU president Tanjit Nagra claims that during the CFS national general meeting last month in Ottawa, University of Winnipeg Students’ Association vice-president student affairs and CFS-MB women’s commissioner Laura Garinger verbally harassed her over union fee increases previously passed by UMSU. The harassment allegedly took place after UMSU executives brought forward a motion that would amend CFS’s policy on international students, calling for the national union to advocate for international student fee increases to be locked at the same percentage increase as domestic students. In Manitoba, this would ensure international students’ tuition fees don’t rise faster than the rate of inflation, as domestic students’ tuition increases are currently capped at the rate of inflation. In provinces where there is no cap on domestic student tuition fee increases, it would only ensure that international students’ tuition fees don’t increase at a higher percentage than other students. CFS’s policy handbook currently calls for the union to advocate for the abolishment of tuition fees altogether, as well as for the removal of any difference between domestic and international students’ fees. The presentation given on Thursday by Sam-King, Pawlak, and Stewart claimed that when Nagra became emotional when speaking about the motion, CFS national executives laughed at her. President of the Pakistani Students’ Association Masroor Khan, who attended the meeting as a proxy for international students’ representative Steffan Aganbi, introduced the emergency motion. Emergency motions may only be voted on by council if the chair rules that the motion is both time-sensitive and could not have been brought forward at an earlier time. The outgoing UMSU chair Karas Elbardisy, who is vacating his position due to a scheduling conflict for future council meetings, said that the motion qualified as an emergency. The next UMSU council meeting is scheduled for Jan. 5. Khan said he brought forward the motion because he feels the mistreatment of the UMSU executives in Ottawa is not only disrespectful to the union, but to international students as well, whose concerns he said were being represented in the motion that UMSU had put forward. “I thought that the mistreatment that the national body [of CFS] has done with our executive was completely an act of hypocrisy,” he said. Khan also said that although the provincial wing of CFS has been receptive and understanding of international students’ issues, the national executive has been the opposite. “On the one hand, the provincial body seems to be very collaborative, but on the other hand the national body seems to ridicule and ignore the demands of international students and disrespects [them],” Khan said. The emergency motion passed overwhelmingly by a hand vote, with only three councillors voting against it. The presentation delivered by Sam-King, Pawlak, and Stewart also went through a number of instances over the last three years in which UMSU and CFS have been at odds with one another. In 2013, UMSU held a review of the union’s membership in CFS following a dispute regarding day-timers. Members of the then-UMSU executive ripped pages of CFS promotional material out of 20,000 student day-timers after learning they were unable to cancel a contract signed by the previous executive for the purchase of the promotional materials. In June, UMSU council finally agreed to pay CFS nearly $1 million in outstanding fees that had been withheld over the previous 3 years. In March, then-UMSU council voted to condemn the provincial chapter, CFS-Manitoba (CFS-MB), for expressing what it called political favouritism toward the Manitoba NDP during the spring provincial election after the lobbying group made statements praising the party’s education-related campaign promises. At the CFS general meeting in July, Sam-King and Brandon University Students’ Union president Nick Brown got into a verbal altercation over UMSU’s unpaid membership fees to CFS, according to Sam-King. 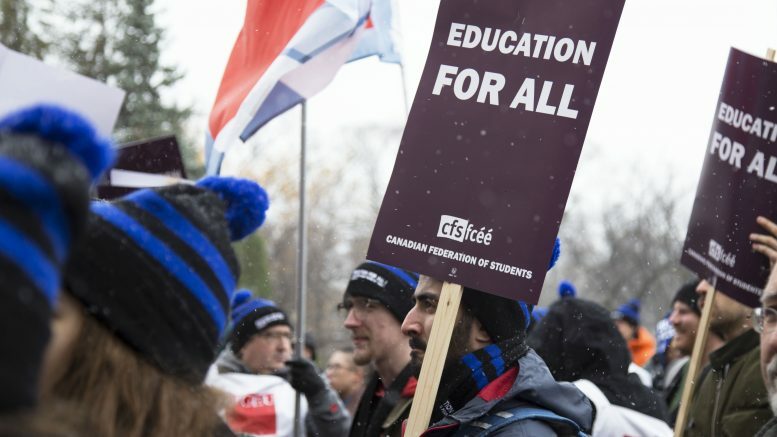 On Nov. 2, Sam-King was allegedly prevented from addressing students at CFS’s National Day of Action at the Manitoba legislature, where students from all of the province’s major universities rallied, demanding free post-secondary education.